Mindfulness is a way of relating to our experience that opens us to the totality of it—that is, we learn to embrace it all, the joy and the heartache. But some experiences are harder to be with. It’s difficult to be with physical or emotional pain, and we often retreat to the mind in search of distractions. But when we are able to fully be with our experience, something that feels like magic happens. It was a Thursday morning at 5am when I received news of my mother’s illness. She was septic and in the ICU at her local hospital. I knew that sepsis was serious, but also that it’s treatable, especially for someone her age (sixty-nine). So after speaking with my aunt, who was with her, I went about my day. I nagged my kids to put on their shoes, as per usual, then got them off to school and ate breakfast. I had a lot to do that day. I also had plans to help a friend move some boxes to her new apartment. The thought of my mom in the hospital accompanied me like a curious stranger throughout my morning. It was an odd day in late April. The sun was out, but it was colder than what is usual for that time of year. I was standing outside near my car as my friend and her husband hauled some of their boxes up to the stairs to their new apartment. The quality of the air caught my attention—it was so clean—and I wandered over to a small field between two houses. Standing there, I thought of my mom and the gravity of her situation. It saturated my body, and mind and seemed to demand my full attention, as if imploring me to stay and be it. For a moment everything fell silent. Looking out at the field, it sparkled from tiny flakes of snow that had touched its surface and liquefied. There were a few goats munching contentedly on grass. I breathed in deep. I felt my feet on the ground and the breath entering and leaving my body. My eyes filled with tears and there was a deep knowing about the seriousness of my mother’s condition, despite overwhelming belief from others that she would get through it. “I feel like this is it,” I cried to my husband the following day. The evening before, her cardiologist had come bounding into her room while I was on the phone with my aunt. We had been weighing whether and when I should travel there, but we’d decided to wait a couple of days to see how the infection responded to treatment. When her doctor came in he was nothing but optimistic. “Her heart is strong!” he bellowed, loud enough for me to hear through the phone. Despite his unwavering optimism, something was off. She was almost completely unresponsive, despite her stable vital signs. “Your mom always seems to get better,” was my husband’s response. And he was right. She’d had poor health for many, many years. Nothing terminal, but a lot of chronic, autoimmune conditions. “I think she’s going to be fine,” he said. “I don’t know. This time feels different.” I said. I booked a ticket to the US to leave a day later. The plan was to stay one night with my dad, then pick up my little brother in Chicago, and together we would make the six-plus hour journey down to El Paso, TX, where my mom had been living for the past two years to be closer to her sister. Suddenly I was there, standing in my body inside of that moment I had so feared as a child. Not only was I facing the death of my mother, but I had been given the gavel to make the decision to release her from life. It wasn’t a difficult decision, just utterly heartbreaking. I could hear every sound in the room, including the sound of my own heart beating powerfully. “Let her go,” I managed to say. I hung up the phone, told my dad she was gone, and went outside to fall apart. A few minutes later, my aunt called back. They’d managed to bring her back, though it wouldn’t be for long. Their hope was to keep her alive long enough for us to say goodbye. So my aunt had both my brother and I talk into each of her ears from two different phones. We could hear each other speaking as we told her the last things we would ever wish her to know. The hissing and beeping sounds of the ventilator and heart monitor played in the background. She was gone, but our trip to Texas was still ahead of us. I must have cried in every shop, restaurant, airport check-in, airport terminal, and bathroom we went that day. At the airport in Chicago, while waiting to board our flight to Atlanta, I studied a woman sitting across from me. She was sitting perched at the edge of her seat, holding an iPad. Her hands were older and painted with liver spots and wrinkles that revealed their character. They reminded me of my mom’s hands, which were always adorned with mismatched rings of turquoise and fake gold. I had even taken a picture of her hands once so that I would always remember their contours. I imagined this woman as my mother—the version of her that was alive and healthy and traveling to see me in Switzerland, which is something that in my eight years here she would never do. I held onto my brother and cried. In silent moments, I thought of her and I thought of the difficult life she had lived, and I cried. I faced the truth, and I cried. Grief is such an urgent and forceful energy. It’s immediate and demanding when it arrives. In fact, it is so powerful a human emotion that some cultures have rituals around grief that enable them to confront and express it, and the storm within our bodies and minds that it stirs up. The truth is, grief is the word that we use to describe the indescribable, visceral heartbreak we feel in the face of loss. The pain of that loss is so big that it demands expression. “How about unabashedly bawling your eyes out. How about grieving it all one at a time.” These are lyrics from a song that speaks to this experience. “Thank you, India,” by Alanis Morrisette. The questions in the song are rhetorical invitations to consider what it might be like if we were to embrace it all—the pain, the sadness, the love, the joy, the grief. All of it. Without the evaluation of our experience, without our thoughts adding layers of guilt, shame, or embarrassment when the urge arises to express it. Despite the thoughts that tell us that to be strong means to not break down. The truth is that a powerful emotion, when embraced, is the stuff of magic. And yet there’s really nothing magical about it. It goes something like this: The energy of an emotion begins to build within us and we have a choice: meet it at the door and engage with it, or turn our backs to it. Turning our backs doesn’t make it go away. 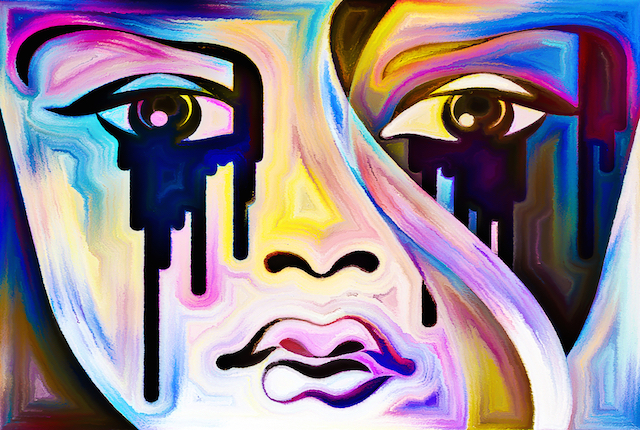 When we can meet grief at the door with mindfulness, the grief is allowed its full expression. We experience the emotion just as it is. Our bodies become animated by it; our chest rises and falls, our eyes fill with salty tears that soak the clothing we’re wearing. Like a wave it rises and rises, only to fall away again. The thing is, our body is actually calmed by the expression of grief, if we allow it. And the calm that follows is like a return to the flow of life and has the quality of magic, but it is also a real physiological phenomenon. Some people turn grief away at the door, while others invite it in to make itself at home in our lives. Our ability to work with grief mindfully means to simultaneously meet the powerful force of grief when it arrives, and let it move through us, unimpeded by the thoughts that would turn it into a story about our sadness. Behind each wave of grief that I met with mindfulness was this vast space that opened up around my experience; and beyond the grief was this sense of joy and gratitude for this precious life. In the end, the infection broke my mother’s heart. For a woman who could “never be loved enough,” this was not insignificant. Her death was painful due to the numerous medical interventions they’d attempted to save her in the last days of her life. She suffered a lot, both mentally and physically, in her life and in her death. There were, in fact, many truths about that experience that were very painful to be with. So many moments during that trip that brought me to my knees. I was between devastation and celebration, anger and frustration, and utter acceptance over the events of my mother’s life and death. But all of these truths I held at once in the presence of mindfulness. The wide open space of experience that mindfulness made possible taught me how inadequate any definition of what she was to me seemed. Stories that had told of both the good and bad aspects of being in relationship with a person were turned on their heads, and the good and bad seemed to blend into something much more nebulous and value-free. A rich tapestry of a life lived on this planet and all that comes with that experience. Some months later, grief still comes to the door now and again seeking expression. It follows an image, or accompanies a song. I meet it with mindfulness and allow it what it needs. And once it has passed through me, it’s no longer blocking the doorway. I can see out to where joy is still standing. Karine is somatic educator and mindful embodiment coach who believes in the innate ability of the body/mind to heal under the right conditions, when equipped with the right resources and tools. She's also a lineage healer, doing the work in her own life to transform inherited and early life trauma so that it's not passed on to her children. Visit her at karinebell.com.